BMW 3 Series Performance, Engine, Ride, Handling | What Car? Despite numerous stories spreading the dirt on diesels, expect the 320d to buck that rhetoric and remain the most prolific of all the 3 Series’ engines – for now, at least. It’s a 2.0-litre four-cylinder unit that pumps out 187bhp, and it’s just the ticket if you’re looking to balance economy with performance. You get plenty of poke from low to mid-range revs, so there’s no need to hoof it to gain speed, which makes it relaxing to drive. And when you do work it hard, it’s as pacy as the C-Class C220d and A4 40 TDI. If you desire a diesel with more shove, a six-cylinder 330d is on the horizon. If petrol power is your cup of fossil fuel, you'll need to look to the 254bhp 2.0-litre engine of the 330i. Although this needs working harder than the 320d, it's ultimately faster and emits a sporty rasp when revved. If you value performance over economy, it's well worth considering. 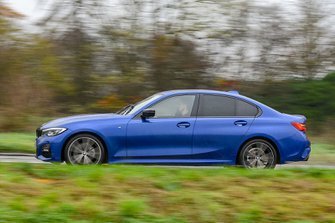 We've also tried (albeit very briefly and only on track) the range-topping M340i, with its mighty 369bhp 3.0-litre straight-six. Not only is it seriously rapid, but it's also muscular throughout its rev range and makes a delicious howl when pushed. The 3 Series comes with either a six-speed manual or eight-speed automatic gearbox. We haven't tried the former yet, but the latter is extremely responsive – more so than the A4’s hesitant dual-clutch unit, so you’re never left hanging when overtaking. 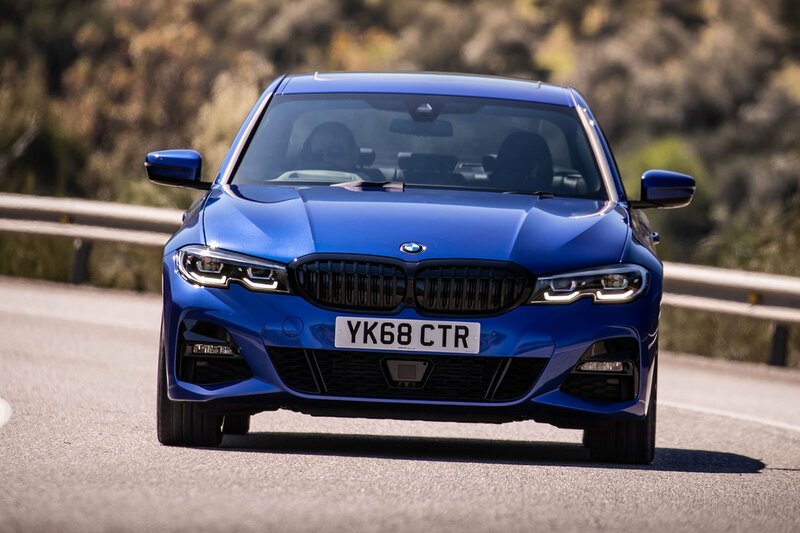 The way the 3 Series rides depends on whether you go for the standard passive suspension, stiffer passive M Sport suspension or do what we’d suggest is best, which is to tick the box for the adaptive Variable Damper Control (VDC) setup. On passive dampers, the best version we have tried thus far is the Sport. Fitted with standard suspension, 18in alloy wheels and optional run-flat tyres, it provides a great blend of comfort and poise. It’s very well controlled, so over heavily undulating roads it won’t bounce you out of your seat like the C-Class can, yet it’s supple enough that bigger, soft-edged bumps, such as sleeping policemen, are ridden over with a good degree of grace. M Sport models on their stiffer passive M Sport suspension and optional 19in wheels are even better controlled. However, impacts over sharp road imperfections are more pronounced, so be warned – sportiness takes a higher priority than comfort. You can delete the M Sport suspension at no cost, though. The best riding of them all, however, are the cars fitted with VDC. We had the opportunity to sample a VDC equipped M Sport 320d model on large 19in wheels on BMW’s Spanish launch and found the ride to be far more sophisticated both around town and at higher speeds. Vertical movements over sudden undulations were kept to a minimum and, although the ride is still on the firm side, potholes and road surface abrasions are less noticeable inside. Over the past few years, BMW has come under fire for dropping the ball over its fabled sporty driving dynamics; remember all those adverts banging on about 50:50 weight distribution? Well, we’ve got good news – the latest 3 Series is BMW back to its brilliant best. Its steering set-up represents the first time BMW has managed to deliver something truly exceptional since electric power steering became the norm; its weighting is consistent and it communicates a good sense of the road surface beneath through the wheel rim. It means you always know how much grip there is, and tells you more instinctively how much steering angle to apply. That’s a good thing, because the steering is quite quick off centre. It takes a bit of getting used to but undoubtedly makes the 3 Series even more reactive to inputs than the XE – let alone the A4 and C-Class. Body control is first class, too. Where the C-Class leans and takes time to settle between quick changes of direction, the flatter-cornering 3 Series will zip left and right like a mouse being shooed by a flighty broom. It’s also beautifully balanced, with reliable front-end grip that lets you carry speed into corners, coupled with plenty of rear grip that keeps the car stable through the bend and out the other side. That said, if you live in a rural area, it’s well worth considering the four-wheel drive xDrive version. You won’t lose any of the 3 Series’ brilliant dynamics, but you get a vast improvement in traction in dodgy conditions. Wind noise is very well contained at motorway speeds, but road noise (on the selection of run-flat tyres we’ve tried so far) is slightly worse than in the A4. Suspension noise – again, probably not helped by the stiff sidewalls of the run-flats – is also pronounced over bumps. The 320d's engine is pretty muted compared with the C220d's, but the A4 40 TDI is even quieter. 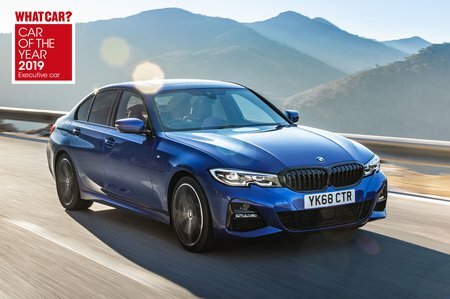 The 3 Series’ optional eight-speed automatic gearbox, meanwhile, is smooth when changing up through its gears and far slicker than an A4’s dual-clutch S tronic ‘box at parking speeds. Just before coming to a halt, though, you can often feel it lurch into first gear, which exacerbates an issue with the brakes; the pedal has little resistance at the top of its travel so, on top of how the gearbox adds a sudden pulse of engine braking, it’s easy to unwittingly brake a little too hard and bring the car to a surprisingly abrupt halt.